You know when you’ve read one book from an author that you absolutely loved, and then you want to read all of their books? That’s what happened after I read one of Rebecca Stead’s middle grade fiction books. Her books are suitable for girls and boys, 9-13. They are set in New York, with First Light also set in Greenland. As a kid, I always wanted to read about a girl who was exactly like me. I wanted to know that there was someone out there who thought the same way I did and saw life through the same lenses. But all those characters I read about, although fascinating and wonderful, came from fantasy worlds or lived in the olden days or had different family situations. Rebecca Stead’s characters learn French verbs, their parents are divorced, their parents are single, their parents are together, their family is Indian, they have grandparents and siblings, they’re worried about money or getting into trouble, they have first kisses, they’re learning about the dangers of social media – they are relatable. 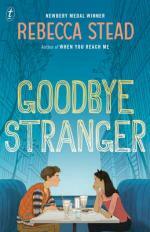 I started with Goodbye stranger, a book about three friends in seventh grade. Bridget had a serious car accident when she was eight, and has always wondered why a nurse told her she must have been put on this earth to do something special, that’s why she survived. Emily’s parents have just divorced, she’s developed curves and she’s very interested in Patrick, an eighth grader. Tab wants to save the world and wants to keep Emily and Bridget in their tight circle of friendship where no one ever fights. Then there’s Sherm, who becomes the bright spot in Bridget’s school day, as well as an unknown teenager who has done something so terrible that she can’t face her friends. Then I read When you reach me. The book references Madeleine L’Engle’s A wrinkle in time – which I loved as a kid. Miranda’s mum is going to be on a quiz show where the winning prize would change their financial concerns. Miranda is trying to help her, plus win back her best friend, Sal – he no longer speaks to her. There’s the laughing man who is a little crazy but seems clued in to the big things in life – she tries to avoid him. Then there’s Colin and Annemaree, who work with her in a sandwich place, as well as Marcus and Julia who share a conversation about time travel that Miranda can’t quite understand. And Miranda can’t quite understand the mysterious notes that someone keeps leaving for her, and why the writer of the notes can predict her future. This one has a slight sci-fi theme. First light – there are two parallel stories. Peter and his parents are living in Greenland for six weeks while his Dad collects data on glaciers and his Mum works on her book about mitochondrial DNA. Thea lives in an underground world below the ice, thanks to the six generations before her who fled from hunters and formed a new community. Eventually, Thea and Peter meet, and their connection opens up past secrets and new beginnings for both Peter and his family and Thea’s community. Heart-warming is such a cliché but these books are so full of heart. They’re not sentimental and they’re not patronising towards kids on the brink of adolescence. The kids and their parents are inherently good people, trying to go about their daily challenges with a mix of courage and vulnerability, and trying (but not always succeeding) in making the right choices. Stead’s books focus on relationships – she tries to create “those moments when characters feel an emotional connection, and really recognize and accept each other. Almost always, there is love between people in those moments. That is so hard to capture, and is so personal, that I know that there’s no way every reader is going to see it that way. But I’m always hoping the greatest number possible will feel it.” Publishers Weekly, Sally Lodge, May 21, 2015. Luckily, I still have Liar and spy to read. Please, Rebecca Stead, write another book! Do you wish one of your favourite authors would publish another book tomorrow?